TeamSnap, the household name in integrated sports management, has partnered with Champion Athleticwear to be the official provider of custom fanwear sold through TeamSnap’s Team Store. The Team Store ecommerce platform gives TeamSnap’s 20 million users direct access to purchase custom branded Champion apparel through the popular app. (BOULDER, Colo.) — NEWS: TeamSnap, the household name in integrated sports management, has partnered with Champion Athleticwear to be the official provider of custom fanwear sold through TeamSnap’s Team Store. The Team Store ecommerce platform gives TeamSnap’s 20 million users direct access to purchase custom branded Champion apparel through the popular app. This is the first of its kind partnership in the sports management industry to merge team information and on-demand, custom fanwear printing technology. 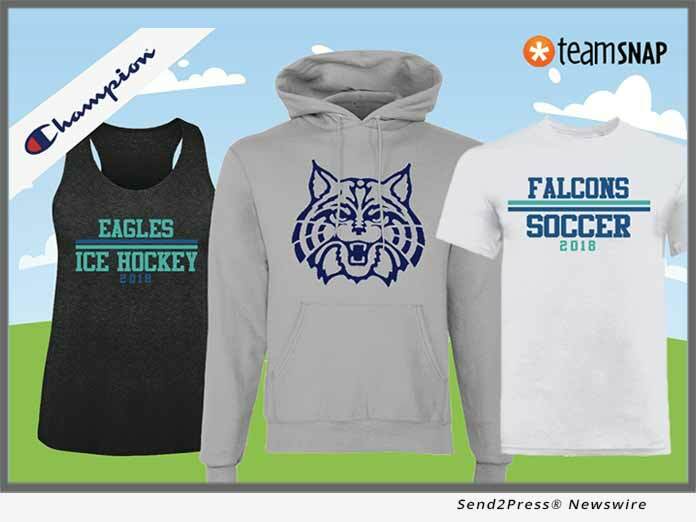 Coaches, players and parents on TeamSnap can now order an array of Champion products – such as t-shirts, hoodies, jackets, sweatpants and accessories – that represent their teams. The Team Store allows teams to easily customize the merchandise to showcase their team colors, name, logo or mascot. Team members can order their branded apparel at any point throughout the season, with no minimums or constraints on when orders can be placed. Anyone with a TeamSnap account can configure their Team Store in minutes and give shopping access to the entire team. Founded in 2009 and headquartered in Boulder, Colo., TeamSnap has taken the organization of youth, recreational and competitive sports into the 21st century. 20 million coaches, administrators, players and parents use TeamSnap’s web and smartphone apps to sign up, schedule, communicate and coordinate everything for the team, the club and the season. TeamSnap makes organizing sports as simple as click, tap and go. For more information, please visit https://www.teamsnap.com/. Since 1919, Champion Athleticwear has offered a full line of innovative athletic apparel for men and women including activewear, sweats, tees, sports bras, team uniforms and accessories. Champion uses innovative design and state-of-the-art product testing to ensure uncompromised quality and innovative apparel for our consumers. Champion Athleticwear can be purchased at department stores, sporting goods, specialty retailers, and at https://www.champion.com/. For more information, please contact us at 1-800-315-0563 or at Facebook.com/Champion, follow us on Twitter @Championusa or on Instagram @Champion. Champion is a brand of Hanesbrands Inc. (NYSE:HBI). This version of news story was published on and is Copr. © eNewsChannels™ (eNewsChannels.com) – part of the Neotrope® News Network, USA – all rights reserved. Information is believed accurate but is not guaranteed. For questions about the above news, contact the company/org/person noted in the text and NOT this website.